These events are for competitive handcyclist and wheelchair athletes only; divisions are not designed for leisure racing. For more information, contact Christy VanHaver at Mary Free Bed Rehabilitation Hospital or call 616.840-8207. Times will be recorded until 12p (noon); course services provided for participants maintaining a 14.0 minute pace per mile. Participants not maintaining this finishing pace participate at their own risk, without event services. To register and participate in the Amway River Bank Run 25K Wheelchair and Handcycle divisions, participants must have a physical disability which prohibits them from running the event. Event Check-in will be available on Friday, May 10 from 11a -8p at the Sports & Fitness Expo, 303 Monroe Ave NW, Grand Rapids and Saturday, May 11, 2019 beginning at 6a, DeVos Place. Late Registration available on Friday, May 10 from 11a-8p at the Sports & Fitness Expo, DeVos Place. Upgrade to a tech shirt ($19.78) when you register. (Limited quantity/no exchanges). Not available at late registration on Friday, May 10. Please click on the following links for tax forms: W-9/W-8. Complete and return ASAP to avoid delay of any prize money you may be awarded. NOTE: Prize money will not be awarded without a valid w-9 or w-8 provided to the Amway River Bank Run. 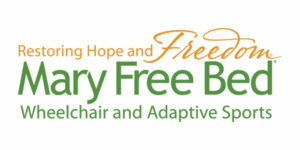 Check out the Amway River Bank Run from the perspective of both wheelchair and handcycle participants via this video from the 2016 event compliments of Mary Free Bed. And, view this YouTube video of Wheelchair Racing yesterday and today!